This applies to Word, Excel, and PowerPoint documents in Office 2016. Earlier versions may have different ways to protect documents. Note: Make sure you have a backup copy of the document. Useful if you forget the password. 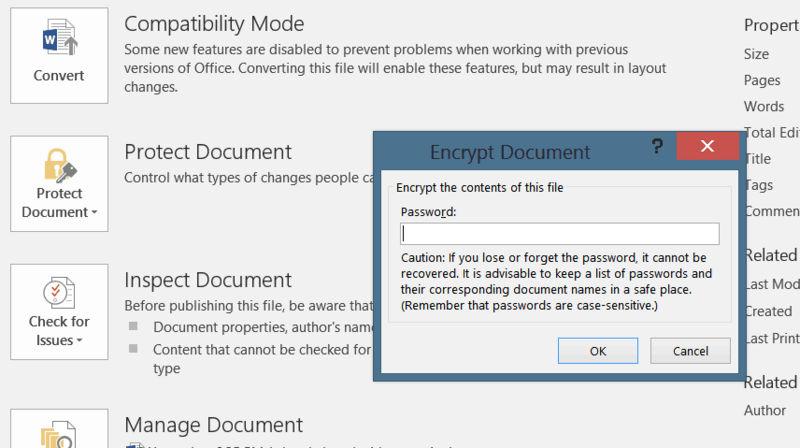 Click File > Info > Protect Document > Encrypt with Password, and enter the password. Click OK. Removing the password is as simple as deleting what you previously entered. Note: Besides Encrypt with Password, there is an option to Restrict Editing. 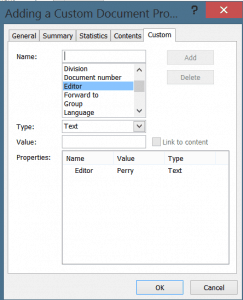 This enables you to prevent new styles being created, for instance, or disallow editing. Press F9 to insert the property value. If the value changes, you will need to press F9 again for the new value to show. With well over a million installations, it’s clear that GeneratePress is a popular theme for WordPress developers. On the WORDPRESS.ORG website, 572 out of 578 reviews awarded it 5 stars. It’s responsive, as all themes should be these days, and can be used as a base for developing your own theme, should you be so inclined, which was Tom Usborne’s original intention. Tom Usborne is the developer and works full-time on this and related products. He provides excellent support. His documentation is also comprehensive. GeneratePress is lightweight because it lacks many features that other themes offer, though it does include Font Awesome. The advantage of this approach is that the theme isn’t laden with features you don’t need. Those you do need can be supplied via plugins. 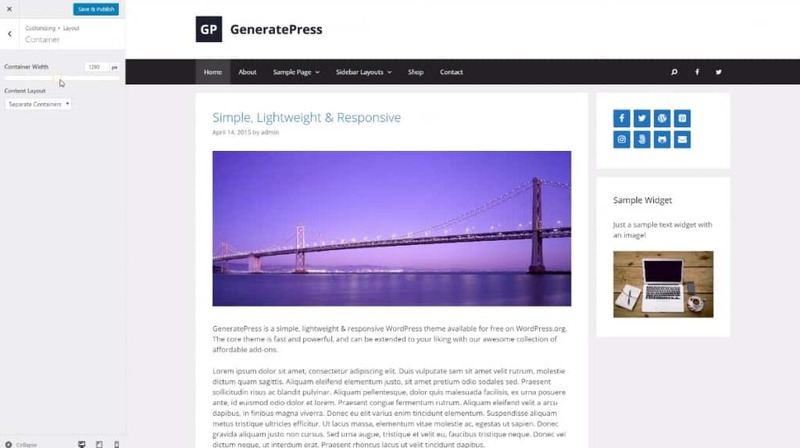 I’m a big fan of GeneratePress and only wish I’d come across it before shelling out for a variety of paid themes that never quite met my needs. I mentioned in my Office Memory Hogs post that Outlook’s add-ins were giving the CPU a hard time. A similar problem occurred with Excel, in that it took a while to load. Again I deselected the add-ins I don’t use, and the problem went away. I did the same with Word and PowerPoint, though neither seemed affected, but why load memory with processes if you don’t need them? Three years ago, after building my new system, I noticed the CPU usage was typically approaching 50% while the system was idle. This was a concern because it generates unnecessary heat which in turn affects the CPU’s life span. It was easy to identify the culprits: Microsoft Outlook 2013 and TrueImage Sync. I didn’t need Sync, so I disabled that process. Outlook, though, seemed more problematic. I found the answer by Googling. The problem wasn’t Outlook per se, but its add-ons. The problem with add-ons has two dimensions. One is they are often installed without your knowledge; the other is they may not be efficient. You can locate the add-ons by selecting File->Options->Add-Ins. At the bottom of the window is a drop-down menu labelled “Manage:”. I deselected them all, as I don’t need them, but if I need one later, I can re-enable it. My PC is now having a well-earned rest. To avoid the delay, select General items and click OK.
Until and including Microsoft Office 2010, Word enabled you to retain the Spacing before value in a paragraph style that included a Page break before, typically Heading 1. This enabled you to start a chapter, for example, part way down a page, which is how it is presented in many publications. The only requirement was to go to File > Options > Advanced > Layout Options and select Don’t use HTML paragraph autospacing. In Word 2013, this option was removed, meaning all chapters except the first now start at the top of a page. The easiest way around this limitation is to save the .docx document as .doc. I’ve been using Madcap Flare for the past year or so and even now I feel I still have a way to go before I can claim to be proficient in its use. Fortunately, my client not only paid for the licence, but also forked out for Bronze maintenance. When you consider that this level of support is the lowest offered and costs US$500 each year, I’m glad I didn’t have to pay for it. On the other hand, it has been responsive and very helpful. Using Flare, I’ve created a large online help system for users of a general insurance broking application. I’ve been impressed by the power of Flare. It’s well worth spending the time needed to come up to speed. At first glance, the user interface (UI) is challenging. Fortunately, there are guides to explain its use. As with most UIs, the average user sticks to a limited subset of the available functions. I have both the Content and Project menus open. These are detachable and I place them them on a separate monitor. 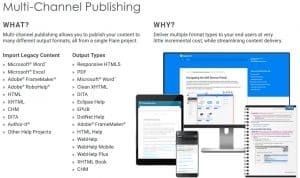 Flare works on the principle of “write once, publish anywhere”. You use a process called “conditioning” to tailor the text to suit an output format instead of having different copies of the same text for different outputs. The HTML5 output is responsive to the medium on which it is shown (desktop, tablet, and mobile). Madcap offers a perpetual licence for US$1,448.00 (includes 12 months of Bronze maintenance). Renewing Bronze maintenance is US$500. Over the years I’ve tested various writing programs to find an improvement over Microsoft Word for managing the development of a novel. They’ve included Grammatica, New Novelist, Story Weaver, yWriter5, and others I’ve forgotten the names of. I had two particular requirements: the ability to export to Word; and a means of locating all scenes in which a character appeared. When Scrivener for Windows first appeared, I gave it a shot, but it seemed rough around the edges, falling short of the Mac version’s capabilities. It joined the others as not being up to the task. Later on, I read an article which was not only complimentary of the latest version of Scrivener, but also mentioned the two features I was looking for. I decided to give it another go. I’m pleased I did.